The infamous Calderdale Way Relay took place last Sunday, attracting a field of more than 1000 competitors, and both team prizes were won by local clubs. Calder Valley Fell Runners’ crack men’s team took the honours for the fifth time in eight years while Todmorden Harriers’ women were their club’s first ever winners at the event. Comprising of six sections totalling 51 miles, the race takes in all the hills, moors and valleys of Calderdale. It is an ‘up and down’ journey with few level sections in and around Halifax, Hebden Bridge and Todmorden and is run in pairs. Following old packhorse ways across the open gritstone hillsides with sections of traditional stone causeway, passing through hillside villages and old mill towns on the banks of the River Calder, the appeal of the route is obvious, particularly on a fine, sunny Sunday in May. Calder Valley FR fielded six teams of 12 and the men’s A team of Ben Mounsey and Andy Swift, Shaun Godsman and Alex Whittem, Mark O’Connor and Martin Howard, Ian Symington and Tim Ellis, Mark Taylor and Steve Edwards and Tom Collinge and Gav Mullholland won by more than eight minutes, completing in 6:07:30. 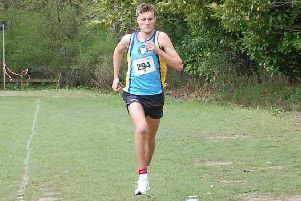 This was despite a number of them having ran in the inter-counties championship the previous day. Wharfedale and Barlick finished second and third and huge thanks went to Nick Small and organisers Halifax Harriers. Tod’s women succeeded in toppling the mighty Holmfirth, who have won the women’s race for the past five years. The strength and depth of the team was demonstrated by the way they reeled in early leaders Barlick, who had established a 15 minute advantage. Tod had Annie Roberts and Rebecca Patrick on leg one, Suzy Straughan and Lucy Burnett on leg two and Rebecca Senior and Claire Duffield on leg three. Mel Blackhurst and Pauline May then took over and Lucy Hobbs and Zoe Dijkman ran leg five before Emma Fiedler and Sarah Glyde finished things off. Calder Valley also had the second mixed team with John Allan and Lee Shimwell, Jo Buckley and Jo Waites, Joanne Stevens and Catherine Holden, Mark Goldie and Bill Johnson, Lucy Collins and Gayle Sugden and Johnny Croston and Luke Meleschko. They clocked 7:19:58. Northowram Pumas had four teams and like Stainland Lions were awaiting their results . Andrew Laird Boldy did a fantastic job of pairing Lions of similar speed. Cameron Rushworth and Amjid Khan both deserve a special mention, having been drafted in at the eleventh hour to replace injured runners – and in Khan’s case having only joined the club this week and wearing borrowed club kit.